With the festive season just around the corner, there are three things you can be sure of: there will be lights above Oxford Street, Winter Wonderland will return to Hyde Park, and you will see lots of ’igloos’ on Instagram. Have you always wanted to chill out (pardon the pun) in an igloo? 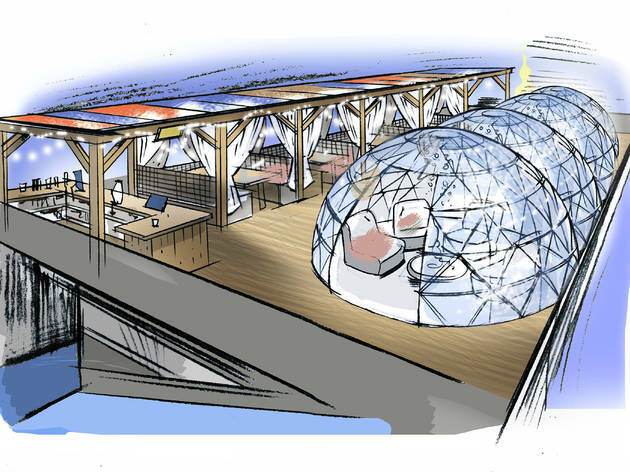 Well, this year, for the first time, top rooftop hangout Skylight is offering up cosy igloos and huts for you and your mates to sit in, while admiring London's skyline and sipping mulled wine. Or, if the mulled stuff isn't your thing, take your pick from a range of winter cocktails at a heated après-ski bar. Perfect, right? Skylight also plays host to Europe's only rooftop ice rink, so get your skates on for a beautiful city night under the stars. The igloos will be open for business on Nov 1. Interested? Book here. Think you’re ready to hit a rink? Try our guide to the best places to ice skate in London.